Looking for a BC apprenticeship in heavy equipment operation? The IUOE Local 115 training school offers the best in Road Building instruction and equipment. Our 12-week program sets you up to earn an apprenticeship as a Heavy Equipment Operator Technician, under guidelines set by the BC Industry Training Authority. The Road Building and Heavy Construction program is made up of 3 courses that run one after another – Road Building Foundation, Heavy Equipment Operator (HEO) and Specialized Equipment. Students may choose to complete the 3-week Foundation course only. These students will be permitted to return for further training at a later date. Heavy Equipment Operator technicians operate heavy machinery such as heavy articulating rock trucks, loaders, excavators, backhoes, dozers and graders. These machines are used universally for all manner of heavy construction, including earth moving, road building, mining and forestry. Technicians may also be responsible for the basic maintenance of equipment, safety around equipment and the compliance of markers, grades and stakes. Why would you want to enroll in this program? Over the next 5 years, BC will experience a shortage of approximately 2,670 heavy equipment operators, or an average of 534 openings per year. With the possible introduction of additional major projects, these numbers may increase. 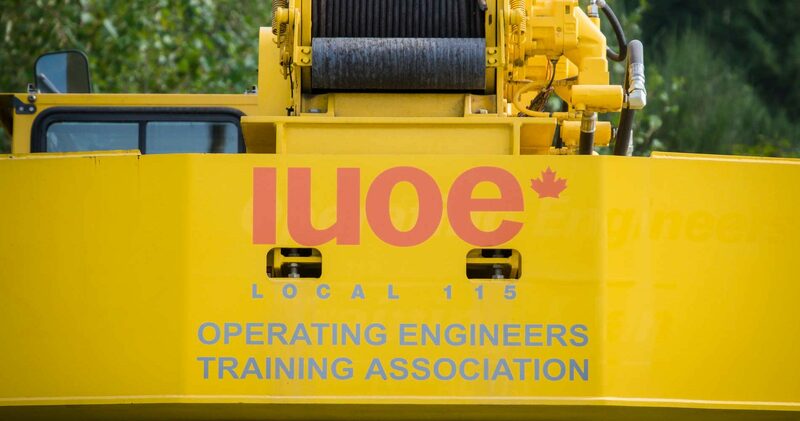 The IUOE Training Association heavy equipment training school is one of the best in all of Canada in terms of equipment and quality of instruction. This three-week course is the entry route into the road building and heavy construction industry. It provides a valuable overview of career opportunities, safety practices, an orientation to job site operations, equipment, tools, operations and maintenance as well as a fundamental introduction to civil engineering. Students earn credentials including Level 1 First Aid, Traffic Control Person and WHMIS. For new apprentices, this program is a prerequisite for entry into the Heavy Equipment Operator Technician (HEO) program. Some students who are experienced operators may be allowed to proceed directly to the HEO program. This module provides further apprenticeship training as designated by the Industry Training Authority. It combines two weeks of in-class theory instruction covering the following six pieces of heavy equipment: articulating rock truck (ART), backhoe, dozer, excavator, grader and loader. This is followed by two weeks of practical equipment lab training on four pieces of heavy equipment: ART, dozer, excavator and loader. The course reviews important information regarding: heavy equipment safety, types and operation, equipment inspections, systems, equipment maintenance cycles, work planning, transportation of the equipment, interpretations of grades and stakes, environmental protection, aggregates and drainage, and erosion control. The final five weeks focus on practical skills, rotating through the following pieces of heavy equipment – ART, Backhoe, Dozer, Excavator or Loader. Apprentices will have the opportunity to specialize their practical experience on one or more machines. If you are interested in this program, go to our online application form and send us your contact information. A representative from the Training Association will contact you. After that, you may receive a full Application for Training package. You will be required to submit a completed application along with a resume, references and a BC driver’s abstract. Qualified applicant files will be forwarded to a selection committee. Successful applicants will be assigned to the class upon confirmation of their ability to attend. Students who complete our course will write theory examinations and will also be assessed on job performance standards. Punctuality, attendance and attitude will also be considered in determining the final course grade. Students must attain marks of 70% or more (criteria established according to standards) for theory and practical assessments. Wallet cards and certificates of completion will be issued upon successful completion of the course. *Students for this course may be eligible to apply for program funding through StudentAid BC.